Living with Bob (Dysautonomia): No casseroles for you. I could go a good casserole right about now. I know the family could too. I've been stuck in bed and pretty much non-functional for a couple of weeks. But the casseroles are nonexistent. You get sick and people bring casseroles. Or at least that's what TV has taught me. But we continue to be a casserole-free zone. Mr Grumpy and my youngest have taken over kitchen duties on top of the cleaning and the laundry. With little grumbling, I should add, as they know how ill I've been. It's been a hell of year and I swear I must be due for my free coffee on the next soul-sapping ER admit. But in reality my small nuclear family and my online family are the only ones who've noticed. Long term chronic illness is not the disease/disorder/syndrome/illness that spurs people to pop over with a casserole to help out. Actually it's not even long term chronic illness. If I think back over the last 8 years there are two people who have brought food to my house to help out, when I was struggling to make my way to the toilet let alone to the kitchen. to be stopping around with food. In reality, you could swap mental illness for a whole host of chronic conditions, like say, Dysautonomia. When I read stories about people becoming ill and then being inundated with food and help it jars. That has not been my experience, or the experience of many patients with chronic conditions. There may be an initial burst of help if an illness begins with a crisis situation. People understand acute need. They respond reflexively. There is a need to do something to help. But if you are stupid enough to do a slow and steady spiral of decline rather than a flashy sudden arse-up, do not wait for the lines of casserole bearing friends and family. Because unless you're one of the lucky few, they will not eventuate. Even should you have repeated hospitalisations or emergency room visits, after the first few times or years, the novelty wears off. Even worse than that initial decline is when you persist in being unwell for a substantial length of time with no foreseeable end in sight. Illness is seen in two modes, recovery or death. If you do neither it seems the wider community doesn't know what to do with you. You haven't met the cultural norms and that challenges a lot of people. This is where blame and disdain sets in. You must want to be ill or you're not trying hard enough. Repeated or sustained caring becomes burdensome. And all it's variations are a common theme for those of us with chronic illness. Sorry about that. I know it must be hard for you to put up with me still being ill. That five minutes once a year you grace me with your presence must be so onerous. I only deal with it every hour of every day for the past 8 years or as I like to now think of it, 2920 days of being ill or really ill. Admittedly it's hard to participate in relationship building and maintenance when you can rarely leave your house because you are riding the porcelain bus every day. The casual spontaneous meet ups, at the front desk at work, or at the local cafe, yoga class etc that form the interconnecting fibres of shared experience are missing. On the odd occasions that you can get out you miss the conversational shorthand. No I hadn't heard the girl from pharmacy was pregnant. No I don't recall that creepy guy at the pub. I have no opinion on the hotness of the new consultant on the ward as I haven't been there for a two years. And those bonds start to fray. People are busy. I hear that a lot. They do care, but they are so busy. She'll still be sick tomorrow. And tomorrow becomes the next day, the next week, the next month or the next year or never. There's no obvious brave battle to fight or win, as every day is a series of tiny battles unknown to others, but very salient to those on the frontlines. No life to be celebrated after the end, as it is slow lingering decline of the it wont kill you, but it'll make you feel like death variety. End simply doesn't have a place in chronic illness. There are no awareness days for long lingering unclear illness. House taught us that a diagnosis can be found for every set of symptoms. Sure your treating team may nearly kill you five times in the hour long episode, the consultant is an arse, but in the end you'll have an answer. Unless you live in reality and know that life and illness are rarely so neatly packaged. Those who have internalised the idea of illness resolution are left confused. All the usual markers of understandable and societally normalised illness are missing. Visits stop. Phone calls stop. Texts and emails stop. And no casseroles appear miraculously on the doorstep. And yet I am sicker now than I was at the beginning. And my family has taken over a host of duties that I can no longer perform. Whilst also caring for me when I am at my worst. This is the story of many with chronic illness and disability. Hidden stories because there is no one left to view and no one left to talk to about it all except for others online in the same position. Chronic illness and disability are isolating. A lack of physical visibility, becomes a lack of thought visibility. We exist on the periphery, in no woman's land. Where if you are lucky you are blessed with one or two people outside your nuclear family who persevere. Last night Mr Grumpy had to carry me to and from the toilet. My youngest cooked dinner and did the dishes, and one of them put on a load of washing. My last attempt to leave the house ended after 30 minutes thanks to overwhelming nausea and pain that landed me back in bed. Because that's where we are at right now. But this is eight years in. Whitenoise to those around us. It took a week for a single family member to call after my last ER admission. I'm always ill and always in the ER these days, and they are busy. As I said whitenoise. Screw casseroles. I like a roast chicken better anyway. You know I never thought I'd post a Katy Perry song on the blog, but this is a bit of a guilty pleasure. You know what, many of us may be forgotten by the wider community, but we are damn strong and still kicking. 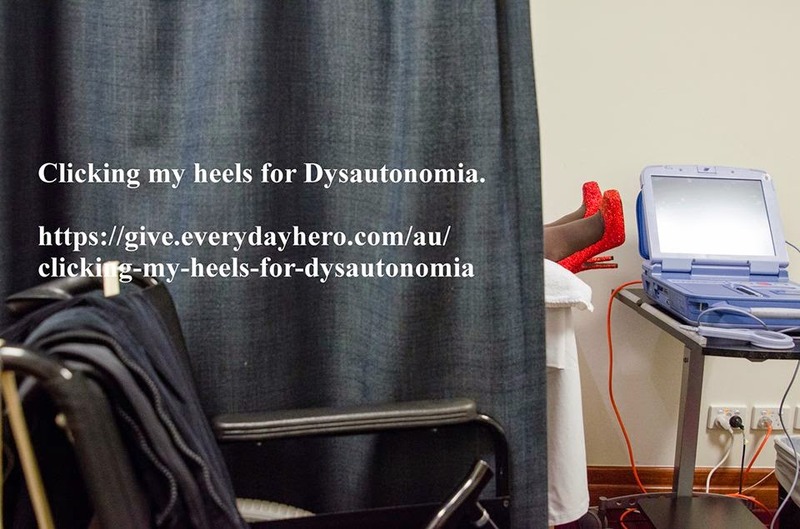 Remember to head on over here to donate to my Clicking My Heels For Dysautonomia, raising money for the Greg Page Fund for Orthostatic Intolerance and Dysautonomia research, at The Baker IDI. Thanks to the generosity of many we've already raised over $2,000, keep donating and hopefully we can reach $10,000. Thinking of you! Your words are so true and the reality stings. We are not invisible; we have hopes and dreams. Hugs! It really does sting at times. I wish for all of it it was different. A friend of mine who has been battling cancer for the past 5 years has said the same thing. At the beginning, she didn't have enough freezer space for all the food being brought over and eventually, her kids grew tired of spaghetti. However, because she knows of my dysautonomia and how bad it has gotten in the past year, she sent me a "care package" from a company so I had quiches, hamburger patties, individual chicken breasts, and even dessert and some lovely potato ball concoctions. She and I were just talking yesterday about how it's other people who are ill who seem to be the first to come to our aid and it's because they know what it's like. One of my chauffeurs has muscular dystrophy and the other has fibromyalgia and I truly think they look upon driving me places as "Well, I can still drive and Suz can't." For the past week or so, MD Lady has been dealing with a gall bladder that really needs to be removed and Fibro Lady has been dealing with pancreatitis. I joked to another friend how inconvenient it was for me that my regularly disabled friends were having additional issues. And I would love to make a casserole and bring it to them, but a) can't drive that far and b) cooking in the kitchen in summer is just begging a round of tachycardia if not passing out. Thanks for your eloquence in explaining these inconvenient truths about dysautonomia. YOU should be showered with cupcakes, my dear! "She and I were just talking yesterday about how it's other people who are ill who seem to be the first to come to our aid and it's because they know what it's like" that is so true. For the most part it is others in the same position who offer the help whether it is physical help or emotional support. Not that there aren't fabulous able-bodied folk around but it is often only those there or who have been there that get it. Lived this reality as I watched my dad live with MS. It hurt, made me angry at people. When your well every body is there for the party. When your chronically ill, deteriorating... You get a whole new perspective of life, people and the real meaning of friend. I listen to old dyke van dyke episodes on u tube... Sappy 60's sitcoms help me in time of crisis. Sigh. It's frustrating as all hell! Add to that the implication that it's somehow your fault. I was at a gathering recently and a family friend introduced me to someone else as 'This is Sarah, she's always overdoing it and making herself sick', and I thought PARDON? That's what we're calling endo and fibro and whatnot now? Goddamn. I'm lucky these days, my little community and I take pretty awesome care of each other, I think in some ways it can be about figuring out how to ask for what you need, too. It's true. I'd never thought of it that way, but its true. Some people I know don't acknowledge I have chronic fatigue, or write it off as depression. So no, no casseroles for me. I have no experience with a illness as rough as yours Michelle but I've managed chronic back pain for years. When things are at a tough phase - as it sounds like it consistently is with your condition - it's so isolating, so hard to keep up with all the everyday stuff of family life. My heart goes out to you - hope tomorrow is a good one. Collect your scars and wear them well. Tiny steps in tiny tasks. The long and winding road to Acceptance.